According to market researchers, most of the modern consumers have a specific shopping process based on how comfortable they are with online shopping, as well as the past experiences with it or their age group. The split decision makers who tend to buy on impulse. The researchers who make enquiries and delve into the intricate details of the product. The bargain finders who look for deals and sales. The loyal customers who have previously purchased from you and have trust in your brand. In order to make your product a success, you need to cater to each of these types of consumers. In this regard, your product description plays a crucial role. The visual presentation of your product can catch the eye of a potential customer, but the description is what convinces them to make the purchase. We’ve written a detailed explanation on how to write product descriptions by analyzing the types of production descriptions there are. This type of product description is used for marketing to an experienced group of consumers i.e. the ones who have pre-existing experience in the niche of your product. Such customers are usually other businesses or production professionals. As such, they are interested in the exact technical details of the product they are getting. The tone of this type of description is highly technical, filled with professional jargon and packed densely with information. When writing a technical product description for a clothing item, there are several main points that need to be addressed. These include: the target customer, product type and style, the type of fabric, additional parts (zippers, buttons etc. ), visual appearance, size range and the country of origin. The description shown above provides all of these details, making it a perfect example of a proper technical description. The most commonly seen type of product description, the aim of a marketing description is selling a product to an average person. It is persuasive and informative above all else, always mentioning in which way the product can benefit the customer, thus often being termed as a ‘marketing copy’. 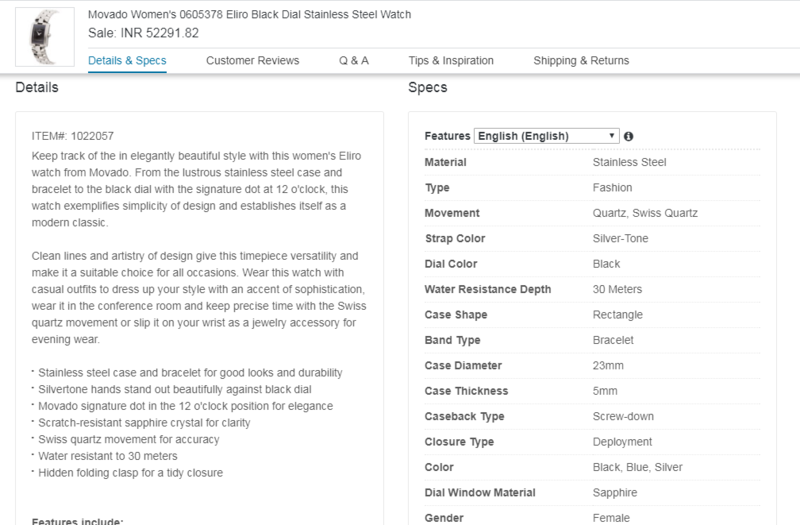 In this description, the product being sold is a branded watch. As you can see, the description not only mentions the most important features – all bulleted and explained – but it also boasts a separate column focusing on the most important technical details, presented in an easily understandable table. Apart from the technical details, the description clearly states how the product benefits the user – “Keep track of time in an elegantly beautiful style with this watch”, “clean lines and artistry of design give this timepiece versatility” or to “dress up your style”. This particular description also goes a step further by clearly outlining where and when the customer can use this product (“conference room” or “jewellery accessory for evening wear”). If you import products under the legal laws of your country, a short description of your product is required by the government. For example, if you import under the HTS, then the US government provides a written set of rules based on the item you are importing. More information on this can be found here. What makes a good product description? It is easy to end up targeting the wrong demographic. For example, if you are selling kids’ electronics, your main demographic audience should include parents, grandparents, and relatives, as they will be the ones who will ultimately be making the purchase. In this particular example, it is very easy to end up with a description that targets the children themselves. Once you are sure that you are targeting the right demographic, it is important to also make sure that you address the customer personally and directly. Research your ideal buyer and figure out which type of content they are compelled by, which type of humour (if any) they appreciate, what type of questions they would ask about the product. These are the questions that you should keep in mind while fleshing out your product descriptions. Adding a personal touch helps generate trust and makes your customers more inclined to buy from you. You need to make your potential customer believe that they absolutely need the product you’re selling. They say the best marketers not only sell a product – they sell an entire dream. To be more precise, they tell people exactly how it will make their lives better by walking them through the entire process of receiving an item, unpacking it and utilizing it in their daily lives. Including sensory words stirs up imagination and makes the customer see themselves owning the product, bringing it closer to them and urging them to buy it. The challenging nature of Plug-and-Play games helps to improve hand-eye coordination, memory, as well as problem-solving skills. Educational DVDs help your child have a complete learning experience by implementing theoretical knowledge through a more practical approach. As you can see, these have a feature-benefit format which first tells you about the features of the product and then how it will be beneficial to the end-user. No matter which type of consumer fits your demographic audience, following this feature-benefit plan will help keep your description persuasive. The product is a Spanish learner kit for kids. The description proceeds to elaborate on how Spanish will be taught to the children via a story on the DVD. Since stories capture a child’s attention very quickly, this is an ideal approach for children to learn. It also lists which features are included within the DVD to help enhance a particular aspect of the learning experience (“games which test a child’s comprehension”). On top of that, it also adds social proof to the description by including a review from the Dove Foundation. While researching a product, consumers tend to look around if they believe they have incomplete information about the product. The typical person refers to Google, and thus may end up at another site which might be more compelling and/or offer lower prices. This is an excellent description where all the information is clearly separatedinto different parts of the description (general information/technical/audio) for easier access. The customer doesn’t need to do any extra research on their own since the research has been done for them. The material of the speaker(Wood) and the power of the speaker (14W) are mentioned in the title of the product. The description focuses on how the speaker will be beneficial to the customer (3” speaker driver with improved sound structure to deliver great bass). It also lets the customer know that the speaker is compatible with devices such as an iPod, Mp3 or a CD player. When people don’t know what to say in product descriptions, they often tend to use phrases like “best quality product” or “superior to our competitors”. Now, the problem with this is that the customers have heard these kind of promises time and time again. It’s far from original and doesn’t exactly inspire trust or instigate action. Instead, you should use phrases which are product-specific, highlighting the most unique aspects of your product which the customer cannot find anywhere else. It follows the feature-benefit pattern that this article has outlined. Even though it does use superlatives such as “perfect” and “brilliant”, it clearly elaborates on them and why they’re not hollow promises. Another thing that really convinces the buyers to make a purchase is social proof. People like buying items which are popular and have already been reviewed. Placing testimonials or short sentences from your reviews in the product description really helps in spurring the buyer to action and gaining their trust. Using words such as “popular”, “best-selling”, “limited stock” has also been known to drive up sales but they should be used scarcely. Excessive usage of these words will look more like spam and can actually drive customers away. However, when used in moderation, these act as powerful tools to increase your conversion rate. While searching for a product that they need, a lot of people already form a particular image in their minds of what exactly they are looking for. Some search for key phrases while some search for images. Don’t assume the consumer already knows that the brand name is evident since they are on your website. A good rule to follow is the “Brand-Model-Item type” format. This makes the title clear and extremely relevant to what they are searching for. The URL should be as clean as possible, optimized for SEO and should give a brief impression of what the customer should expect if they click on the link. For example, if you have promise rings made of opal which you would like to list, this would be a good URL would be “/blue-opal-promise-rings”. An excessively long, filled with numbers or gibberish is a put-off both in terms of SEO as well as sales. In a customer’s mind, sloppiness in a product description translates into sub-par quality of the product itself. Therefore, it is important that a product description is carefully proofread so as not to discourage potential customers or drive them away. If you are using another site as a template for your products since they carry similar ones, think again. Even if you are a retailer, do not make the mistake of blatantly copying and pasting from manufacturer sites. Unoriginal content not only comes with a risk of offsetting your customer, but also the search engines. Since search engines prioritize content above all else, the chances of getting hit by a penalty due to copy-pasted content are pretty high. Ultimately, this can significantly reduce your exposure to potential customers. Most buyers do not have the time or patience to read an extremely long description. While researching the product, they look for the most important and relevant information on a product by skimming the description that goes with it. As such, a good description should be concise and organized so as to facilitate this. This means bullet points and short paragraphs instead of unsightly blocks of text filled with fluff. Ultimately, the average product description should be between 200 and 300 words. 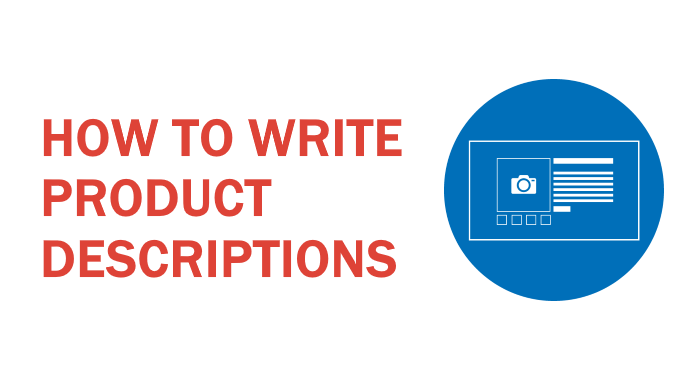 We laid out some of the dos and don’ts when it comes to writing product descriptions if you want to write them by yourself. Since these product descriptions can also be included in a brochure and since you might want them written by a professional, here is a list of Best Brochure Content Writing Services that can help you create the perfect brochure.